Chung Eui-yong, front left, head of the presidential National Security Office, Suh Hoon, front right, the chief of the South's National Intelligence Service, and other delegators. A South Korean presidential delegation arrived in North Korea on Wednesday for talks to arrange a summit planned later this month and help rescue faltering nuclear diplomacy between Washington and Pyongyang. It's unclear who the South Korean envoys will meet in the North or whether they will see North Korean leader Kim Jong Un before flying back to the South later Wednesday. South Korean President Moon Jae-in's office said the delegation led by his national security adviser will be carrying a personal letter for Kim. 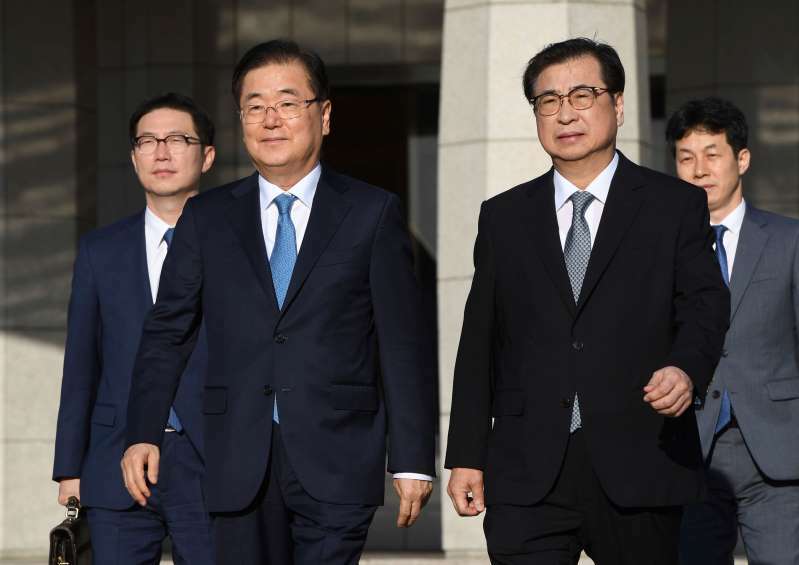 Moon said the envoys are tasked with a crucial role at a "very important time" that could determine the prospects for lasting peace on the Korean Peninsula. Seoul also wants a trilateral summit between the countries, or a four-nation meeting that also includes Beijing, to declare a formal end to the 1950-53 Korean War. The U.N. General Assembly in late September would be an ideal date for Seoul, but many analysts see that possibility as low, considering the complications of the process and how far apart the parties currently are. U.S. officials have insisted that a peace declaration, which many see as a precursor to the North eventually calling for the removal of all U.S. troops from the Korean Peninsula, cannot come before North Korea takes more concrete action toward abandoning its nukes. Such steps may include providing an account of the components of its nuclear program, allowing outside inspections and giving up a certain number of its nuclear weapons during the early stages of the negotiations. While an end-of-war declaration wouldn't imply a legally-binding peace treaty, experts say it could create political momentum that would make it easier for the North to steer the discussions toward a peace regime, diplomatic recognition, economic benefits and security concessions. The North has accused the United States of making "unilateral and gangster-like" demands on denuclearization and holding back on the end-of-war declaration. North Korea's Foreign Ministry on Tuesday published a lengthy statement on its website saying that an end-of-war declaration would be a necessary trust-building step between the wartime foes that would "manifest the political will to establish the lasting and stable peace regime on the Korean Peninsula." South Korean officials said an end-of-war declaration will be among the issues discussed in the meetings between the South Korean envoys and North Korean officials. "Our government believes that an end-of-war declaration is very much needed while we enter a process toward stabilizing peace in the Korean Peninsula through complete denuclearization," said Chung Eui-yong, Moon's national security adviser and the head of the South Korean delegation to Pyongyang, in a news conference on Tuesday. "We will continue to put in efforts so that an end-of-war declaration can be reached by the end of the year. We are always maintaining close communication with the United States." Chung said inter-Korean engagement is a crucial part of the efforts to resolve the nuclear crisis. "If needed, we should pull forward the negotiations for the complete denuclearization of the Korean Peninsula with the development in relations between the South and North," he said. Any progress could depend on whether Moon's envoys are able to coax a stronger verbal commitment from North Korea on denuclearization to help put the nuclear talks between the United States and Pyongyang back on track. U.S. President Donald Trump called off a planned visit to North Korea by Secretary of State Mike Pompeo last month, citing insufficient progress in denuclearization. The resumption of U.S.-North Korea talks sometime before the next inter-Korean summit, which will likely take place in mid-September, could give Moon more to work with when he arrives in Pyongyang. Considering the difficult circumstances, it's unclear whether Moon's envoys will be able to get anything other than a fixed date for his new summit with Kim. The two past inter-Korean summits in April and May removed war fears and initiated a global diplomatic push that culminated with a meeting between Kim and Trump in June. But Moon faces tougher challenges heading into his third meeting with Kim with the stalemate in nuclear negotiations between Pyongyang and Washington raising fundamental questions about Kim's supposed willingness to abandon his nukes. Moon has been aggressively pushing engagement with North Korea in past months, but the lack of progress in nuclear talks could mean an end to the inter-Korean detente. "Now is a very important time for establishing lasting peace in the Korean Peninsula; that's why special envoys are being sent to North Korea," Moon said Monday. "Peace in the Korean Peninsula goes together with the complete denuclearization of the Korean Peninsula, and the government is closely examining and carefully managing the situation." The Korean War ended with an armistice, leaving the peninsula technically still at war. Moon has made an end-of-war declaration an important premise of his peace agenda with North Korea.